Joshua (center) and his friend Dwayne sold lemonade and snacks to help their city. When 9-year-old Joshua Smith heard on the radio that his city was having money troubles, he decided that he was going to help. Like other communities in the United States, the city of Detroit, Michigan, is having problems with its city budget. This year, the city is expected to have a $200 million deficit, or budget shortage. This means that to keep the city running, Detroit will likely have to spend $200 million more dollars than it has. Because of this large deficit, the city government might have to lay off some of its workers and shut down some city parks. 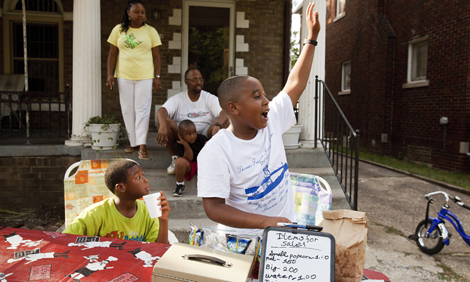 To help raise money for Detroit, Joshua started a lemonade stand in front of his family’s house. He asked his friend Dwayne Durant to help him. They sold lemonade, water, fruit punch, and homemade popcorn to people in their community. By selling these refreshments, Joshua raised more than $3,000. He donated all the money to the city of Detroit. It will be used to help take care of city parks and community centers. Joshua hopes the money will also help keep the Zussman playground clean. It is one of his favorite places in his neighborhood. Because of his efforts, Joshua is getting a lot of attention in his community. A city councilperson, JoAnn Watson, gave him a “Spirit of Detroit” award. Detroit’s mayor, Dave Bing, even called him on the phone to thank him for all that he did. The mayor hopes that when Joshua grows up he will start his own business in Detroit. He also thinks that Joshua would make a great community leader one day. What kind of problems is the city of Detroit having? How did Joshua Smith help Detroit?